Are you over the age of 21? Are you on the fence about getting braces as an adult? You are not alone. According to the American Association of Orthodontists, one in five orthodontic patients is an adult. Why are so many adults opting to get braces? In addition to getting the smile they have always wanted, many adults are choosing braces for a variety of different reasons. Here are just a few. Today’s braces are not as bulky as they were years ago. And with advances in technology, the time it takes to get straighter teeth has been shortened. Today’s braces also come in a variety of different material to help fit the needs and the lifestyle of many adults. Ceramic braces are great for those who don’t want their braces to be easily noticed. They are translucent and blend in with the patient’s own teeth. Braces are also more affordable than they were years ago. Although most dental insurance doesn’t offer to pay for adult orthodontics, there are companies who offer credit for these types of services such as Care Credit. You can call our office at Reese Family Dentistry to learn more about our financing options. In addition to creating a beautiful smile, braces and other adult orthodontic treatments can help fix a number of oral health issues. 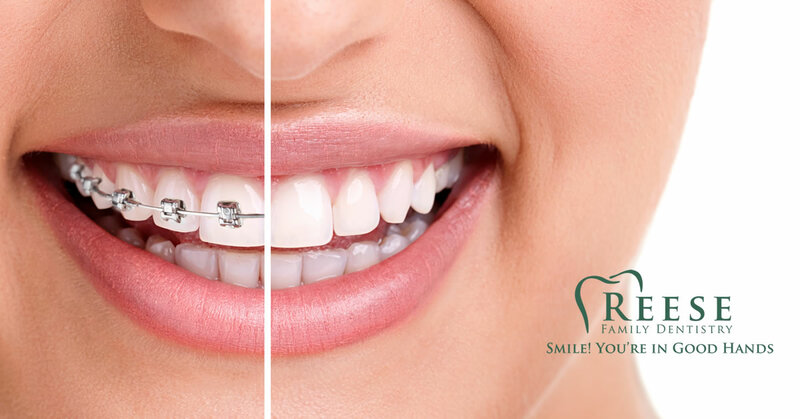 Fixing the above issues by straightening your teeth not only helps the issue you are having but also decreases the risk of future problems with your teeth and overall oral health. Even though many adults had braces as kids, some notice that their teeth have moved or shifted as they have gotten older. This can be due to several factors. However, neglect to wear a retainer after orthodontic treatment is the number one reason. Teeth may also shift due to health, an accident, or delayed growth. Adults who once had straight teeth as a child or young adult may find themselves with crooked or misaligned teeth as they get older. Getting adult braces as an adult can help you get back your perfect smile. People are living longer and are doing more to keep their teeth. In fact, it is not uncommon for adults in their 40s and 50s to get orthodontic treatments. People are taking care of their teeth and choosing to straighten and align them properly to make them stronger so that they can keep their teeth longer. GIVE REESE FAMILY DENTISTRY A CALL TODAY AND GET ON THE ROAD TO A STRAIGHTER SMILE! Since every patient is different, and everyone has specific orthodontic needs, Dr. Reese will customize your orthodontic treatment plan to meet your needs. Don’t go another day without the smile you have always wanted. Take the first step by scheduling your no-cost initial orthodontic evaluation. Give us a call at (870)424-5900 or request an appointment online by filling out and submitting our online form. You can find it by clicking HERE.